This is about an issue that has been reported several times in very many occasions. We’d like to take the time now and talk about the problem. 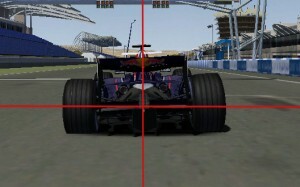 It has been reported, that sometimes during online races the cars begin to drive oblique. This looks very strange and obviously neither good, nore realistic. The issue, that cars begin to lean to one side during online gaming is known, but unfortunately, that’s not an issue we are responsible for, but a bug or rather a shortcoming of rFactor. You see our mod has one of the most advanced physics ever developed for rFactor. Our physics-guys went into great length, to use every option available to simulate the driving as realistic as possible. We are at a point, where we touch the limits and unfortunately this tilting is one sign of rFactor giving up on us. the damper settings. We have the option to either use unrealistic values to workaround a graphic-bug, or keep the realistic physics and accept the bug, which is only caused sporadically. We chose the latter. the setup: It’s not really clear how, but the setup has some influence on the problem, but it doesn’t cause it. the track: The modelling-detail of the track-mesh influences how precisely rFactor can calculate the correct position of the car-model on the track. On tracks with low surface detail, low face count and large faces, the scanning looses precision and can also cause this bug. Obviously, we are not happy about this either, we were in contact with ISI, but obviously they won’t fix it untill a possible successor of rFactor. We also can’t do the track-modelers/-converters job, to deliver good tracks, who don’t cause problems. Also, as far as we know, we are not the only modding team having this issue. So you have the option: either accept the bug or check for damper-settings in the physics files, play with the values and find a change, which avoids the bug, but still gives you tolerable driving. We just have to face that Rfactor is almost 4 years old game. It has game engine that is modded from F1C wich is 6 years old game. I havent EVER seen this problem with CTDP 2006. Only with MMG 2007 V1. :/ I love your mod and physics of the mod, so dont try to fix this. De todas formas, sería interesante que junto con el parche 1.1 sacarais algo para solucionar esto, aunque sea para instalar opcionalmente, porque la mayoría de la gente que quiere retransmitir carreras o colgar vídeos de sus respectivos campeonatos, no puede convivir con este bug. Ok, since probably not everyone undestood it, I try to get out my rusty spansh. At the moment, we have no plans to fix something, which is not our bug. Btw, I would like you to notice the EXTREME bug found with the Williams car in DX8 (not load car in track). – Why I don’t see the “Oblique cars bug” in your public promo race at Brazil? – Maybe if I’ll use “Round 18” upgrade on other tracks (like Bahrain) I also will don’t see the bug? I believe that the Williams DX8 bug has already been fixed now, could be wrong but Im sure I seen it in one of the internal updates a few weeks ago. The oblique-cars-bug is hard to reproduce. It occurs, but it’s not always reproducable and doesn’t happen always. This is why only a handfull report it. Well, if it is of any help, ISI Northamptonshire is where it (oblique cars) occurs with more frequency with mods like CTDP06 and MMG07. Especially from Copse to Stowe you can see it a lot. Opino lo mismo Mcnolo. Nosotros vamos a iniciar una liga en dos meses, junto con el inicio de la F1, y este mod era el más aceptado por todos los miembros….. pero este bug, lo descubrimos en una de las pruebas, literalmente “nos ha roto”, yo personalmente no puedo con él, lo siento, pero es superior a mi. Esto mismo, nos pasó en un anterior mod, el FSONE, empezamos con la versión 1.1 y fue ok, cuando cambiamos a la 1.3, nos pasó esto mismo, pero era mucho más exagerado, era muy muy muy desagradable a la vista. Cuando cambiamos a la versión 1.7, se solucionó. El mod es genial y tengo que dar mis felicitaciones, por las físicas, hace tiempo que no encontraba un mod que cuando tocaba algo, actuaba como teoricamente tenia que hacerlo, los detalles de los coches, geniales, pero…….. este bug nos ha matado. Contra más lo quieres ignorar, más te fijas en él. Virtual Series have exclusive invitation to the World Series (real world) for the Barcelona circuit in 2009, the Mod elected was CTDP 2006, We expected this Mod 2 years, is the best, but in big-screens of the Barcelona Circuit, does not look spectacular (oblique cars), it is a sad because this mod is really good. you said that it is problem of rFactor, you comment: At the moment, we have no plans to fix something, which is not our bug. But with his experience, You might suggest to minimize or fix it? Appreciate your time and great Work¡¡. I think this comment really convinced us all to start working on it right away. Great, trashing the best mod ever by a problem that could be solved. @Wayfarer: So, how would you solve it? With the default setup, it´s ok, the problem it´s how change this setup. For this, offline is correct, and the online succes this problem. I observe, that there are any cars that´s more to exaggerate. That´s the valor/s exactly that provoke this problem… I don´t known. The fsone 1.3 exist this problem, we change to 1.7 and desapear. I talk with fsone modeler´s and we don´t know because. Sorry but my bad english, I wait, that understoodme. Thanks.